We’d love your help. Let us know what’s wrong with this preview of BILLOO THE TV STAR by Pran Kumar Sharma. In 1973, cartoonist Pran was looking for a school going teenage boy who could feature in the comic strips. Thus he created a boy with a long hair covering his eyes and named him BILLOO. This lanky was liked by the readers so much that the editor of the magazine asked the cartoonist to increase the episodes from one page to two. 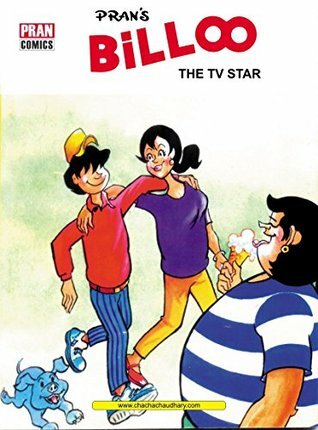 Billoo is seen roaming the streets with his p In 1973, cartoonist Pran was looking for a school going teenage boy who could feature in the comic strips. Thus he created a boy with a long hair covering his eyes and named him BILLOO. This lanky was liked by the readers so much that the editor of the magazine asked the cartoonist to increase the episodes from one page to two. Billoo is seen roaming the streets with his pet pup - Moti. When he is at home, he is stuck to the TV.Billoo and his gang which includes Gabdu, Jozi, Mono, Bishamber etc; are at loggerheads with Bajarangi, the wrestler and his aide Dhakkan. They are always in search of some excuse to showdown each other. Jozi is friendly to Billoo, but her dad Colonel Three - not - Three doesnot like the boy and always points his gun at him. Billoo and his friends are often seen playing cricket in lanes of the block, and their score is few smashed windows. To ask other readers questions about BILLOO THE TV STAR, please sign up. Pran Kumar Sharma (born August 15, 1938), better known as Pran, is one of the most successful Indian cartoonists. Pran graduated with a Master of Arts (Political Science) degree. He then completed a four-year course in Fine Arts from Sir J. J. School of Art, Mumbai. Pran began his career in 1960 as a cartoonist for the Delhi-based newspaper Milap with comic strip Daabu. In 1969, he sketched Chacha C Pran Kumar Sharma (born August 15, 1938), better known as Pran, is one of the most successful Indian cartoonists. Pran began his career in 1960 as a cartoonist for the Delhi-based newspaper Milap with comic strip Daabu. In 1969, he sketched Chacha Chaudhary for the Hindi magazine Lotpot, which made him famous. Pran has also created other cartoon characters like Shrimatiji, Pinki, Billoo, Raman, Channie Chachi and others, which are regularly published in Indian magazines. Maurice Horn, the editor of World Encyclopedia of comics, has described him as "Walt Disney of India" in World Encyclopedia of comics.